Ubisoft has removed the mobile app required to unlock some of the in-game upgrades. Game cannot launch when installed on a drive managed as a Storage Space. 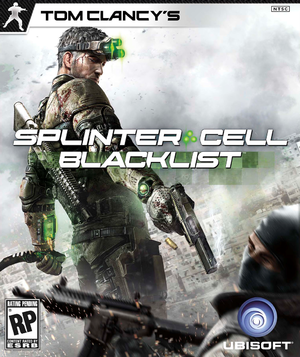 Delete or rename Copyright.bik, Disclaimer.bik, ESRB.bik, Logo_Clancy_01.bik, Logo_MiddleWare_01.bik, Logo_Ubisoft.bik, and Logo_Ubisoft_Clancy.bik. Up to 4x TXAA (Nvidia only), FXAA, up to 4x MSAA and SSAA 2x2 Grid or 2x2 Rotated Grid. Multiplayer mode is capped at 60 FPS. High frame rate can break some of the cutscenes. Separate sliders for 1st and 3rd person. Can only toggle between 3 pre-set layouts (multiplayer only). The gamepad layout for Single Player/Co-op. The gamepad layout for Multiplayer (Spy). 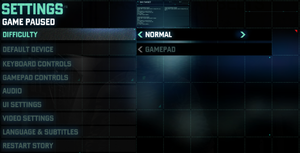 The gamepad layout for Multiplayer (Merc). Co-op: Fourth Echelon (4E) Missions only (2 players). Find and change "WindowStyleFinal=1" to "WindowStyleFinal=2" or "WindowStyleFinal=0". Launch the game via Uplay only to prevent Steam from restoring "WindowStyleFinal=1". Find and change "MaxRefreshRate=60" to "MaxRefreshRate=(x)" where (x) stands for your refresh rate of choice. Find and change Occlusion_Off=2 to Occlusion_Off=0. 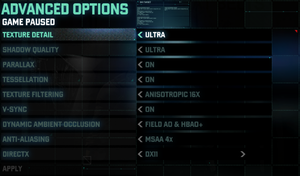 For additional performance improvements, find and change UseMotionBlur=1 to UseMotionBlur=0. To ensure the changes take effect without the game overwriting it, set the file to read-only. Change WindowStyleFinal=1 (fullscreen) to WindowStyleFinal=2 (for borderless windowed) or WindowStyleFinal=0 (for windowed). A recent Uplay update made the game incompatible with the Ubisoft network. Uninstall Uplay. Uplay uninstaller allows you to remove the client while keeping your games. Download and install Uplay version 21.1.1.4898. Uplay must not be launched yet. Go to <Uplay-folder> and edit version.txt. Delete all its content and write 5757. If your Uplay password includes special characters, change it to only include alphanumeric characters (letters and numbers only). Try disabling all network adapters other than the primary network adapter, then do a full system restart and launch the game. Uplay/retail customers should install the latest patch from Ubisoft when attempting to play with Steam customers. Set DirectX 9 in the video menus and shut down the game. If you don't restart Uplay, it will launch the DirectX 11 executable again regardless of selected options. Open the savegames folder, you'll find a folder with your uplay account nickname hashed, it should be the only folder inside the savegames folder unless you have logged in and played as more than one uplay user. Inside, sort the folders by date modified, copy the most recent ones from one of the folders(in most cases: folder "91") to folder "446"
Launch the game, you should find your save game intact and working. It's a good idea to make a small change, purchase, gear customization to check whether or not it was successful. ↑ 1.0 1.1 File/folder structure within this directory reflects the path(s) listed for Windows and/or Steam game data (use Wine regedit to access Windows registry paths). Games with Steam Cloud support may store data in ~/.steam/steam/userdata/<user-id>/235600/ in addition to or instead of this directory. The app ID (235600) may differ in some cases. Treat backslashes as forward slashes. See the glossary page for details.